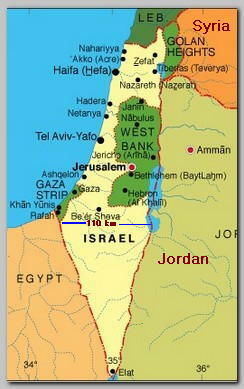 ISRAEL, in the Middle East on the Eastern coast of the Mediterranean Sea, is a small country. The country is independent since 1948 and its sovereignty stretches on 22,000 km including the Golan Heights and United Jerusalem. ISRAEL controls also about 4,000 km in the West Bank that are in an ongoing negotiation with the Palestinians but also with the Arab World and the International community. The population of ISRAEL in 2007 is about 7.1 millions, from them 76% (about 5.4 millions) are Jews, 16% (about 1.4 millions) are Sunnite Muslims and the rest, 8% are Druze, Arab Christians and other Christians denominations. ISRAEL is today one of the most inhabited countries in the world. The return of Jews to their homeland, since the end of the 19th century, inflamed one of the most complicated conflicts possible. What the Jews saw as their natural right to their biblical Holy Land was regarded by the Arabs as an immigration of foreigners. The Balfour Declaration from 11/02/1917 where the UK promised to establish a “Home” for the Jews in Palestine, broadened the conflict from a local territorial conflict, one of many, to a larger conflict between the Western colonial empires and the Arab and Muslim nations. In the Arabs eyes UK never had the right to promise land that was not theirs to a nation that was not existent here. Ever since Balfour Declaration the conflict is a main issue between the Arab world and the Western Democracies. There are, evidently, more layers to the conflict. The small ISRAELi state is an ideal scapegoat to all the problems of the Arab and Muslim world and a perfect diversion to the ongoing bloodshed and atrocities between the Arabs themselves, which are, dozens of times, more dreadful then the ISRAELi Arab conflict. The conflict serves also as the playground of the super powers to promote their own interests. There are more layers to the conflict but this article deals with the Global Jihad and not the ISRAELi-Arab conflict. Today one of the justifications to the Global Jihad is the existence of ISRAEL as an arm of Western super power intervention in the Muslim world on its expense. Therefore the victory of Jihad can not be completed without the destruction of ISRAEL. In case of all the Western democracies, the purpose of the Global Jihad is to “punish” the West for its arrogance, to remove the Western grip on Muslim land, society, economy and politics and to gain control on the resources of the Muslim nations such as oil. There is place for existence of the Western Democracies, if they back off the Muslim World. That is not the case with ISRAEL – ISRAEL must be destroyed. There are, indeed, voices in Western Democracies that see the support to ISRAEL as a mistake and are willing to compromise with the Muslim world on the expense of ISRAEL. ISRAEL is also in a very delicate situation with its own large Muslim population, 16%, many of them followers and supporters of the Jihad ideology that reject any idea of a Jewish state on Muslim soil in the Middle East . ** Israel is an exception in the Middle East in four dimensions. It is the only, not Arabic country, in the region. It is the only country in the area that Muslims are the minority and non Muslims – Jews, are the majority in what is considered by the Arabs and Muslims as their domain. Only in Israel Arabic, the language that unites the region, is a secondary language spoken only partially. Israel is the sole democracy with a political culture that is misunderstood, very often, by her neighbors. Israel is, therefore, in all practical aspects an alien to the region arousing suspicions and fear. The main impact of the Global Jihad on ISRAEL is that the concept of peace in exchange for territories with a Jewish state is of no relevance to many in the Middle East. Once again in Jewish history the destruction of ISRAEL, with the annihilation of the Jews themselves, is an openly declared political agenda.